Building your own wooden spiral staircase can be an exciting experience in construction. Make sure that you have enough experience in such works as need some skills in mathematics, sawing, exact measurements, and most of all you will need time and patience. 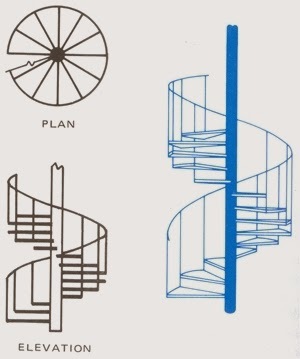 If you do not have these qualities, you can buy ready-made set for a spiral staircase, and it can be built in 3 hours using only one drill (this case is discussed below.) However, if you prefer to do everything with your hands, then this article will tell you in detail how to build a step through the wooden spiral staircase, which will persist for decades. Step 1: The calculations of the project . The most important stage in the construction of the spiral staircase - dimension. This is the only thing to do is ideal to get it right. So be careful and do not rush. First we need to measure the distance from the Roof to floor. It is assumed that already have an opening for the stairs. If not, then proceed to carving opening to perform this measurement. We assume in this article that the distance from the roof to floor 3 m in this case, to determine the number of steps required, we divide by 7, as lifting up a notch equal to 18 cm is ideal. 300 cm ÷ 18 cm = 16.6 degrees. Round off this value to 17. The upper level will be 17 steps, so you will need to construct a 16-speed.Then calculate: 300 cm ÷ 17 = 17.64 cm steps Using this calculation, we found that the height by one level (the vertical distance from one step to another) is 18 cm width of each step on the inner edge will be 10 cm to ensure alignment with the 10cm central support with a space for the weld at the top and on the sides. To determine the size of steps to look at the outer edge of the outer diameter of the stairs without handrails and railing uprights. Central support and two steps up the overall diameter of 172 cm, you can determine the length of the circumference, diameter taking the stairs and multiplying by 3.1416. Thus, 172 cm x 3,1416 = 540 cm (rounded to the nearest integer). So how do we do 17 steps, 210 ÷ 17 = 32 cm to create an overlap in 2.5 cm, we will step width on the outer edge of 35 cm (horizontal size from front to rear). Step 2: the central pillar. Now you have all the necessary dimensions, so it's time to start assembling the stairs. 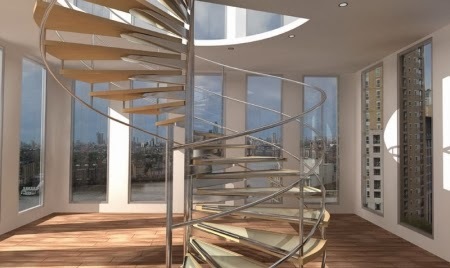 To ensure the reliability it will be a wooden spiral staircase with a central pillar of metal and metal bases steps. Later, if you want, you can cover the metal pole wood veneer. When using a steel pipe size of 9 cm Schedule 40 as a central support with outer radius of 10 cm 400 cm cut the material. Of these 400 : 300 cm designed for 17-speed, 90 cm for the overhead guard and 10 cm further as a small reserve. If you do not want to mount it on a central portion of the upper enclosure, just remove the extra 90 cm . Prior to the installation of the central support is necessary to partition column in the places where you want to install stages, ie every 17.64 cm, we have identified in Step 1. Then, you can cap the upper end by means of a thick circular plate neatly welded. At the lower end should be square pad height of 1 cm and sizes 30 to 30 cm, brewed from all sides. Then make a hole in each corner of the site for use in concrete anchor bolts for connection to the foundation. Step 3: construction stages . Steps to deal with bases in two ways: you can either purchase a ready-made kit, or make them by yourself using steel flatness safety sheets (also called corrugated plates). Attach the stage for the central support at the marked locations, make sure to attach them perpendicular to the support in both directions. Set them according to the selected direction of rotation of your staircase. Each next step should overlap the previous 2.5 cm so that you can attach a connecting strut. Connecting struts are called racks that attach one step to another. For your staircase you can choose any material racks handrails and connecting struts from metal to wood. However, no matter what material you use,always check yourself that you do not forget to attach each connecting rack. When all your base speed and connecting racks will be installed, go back and weld all base steps to the central support. Then use the wooden steps, which are superimposed on the base metal. Like our calculations in Step 1, steps should be the size of 10 cm internal width, 35 cm in width and the outer 80 cm in length. Then you can just make holes in areas where established connecting the rack. Now step and connecting rack mounted, it remains only to attach balusters and handrail. As well as for connecting racks, you can choose any type of design for rack railing, but it is best to choose something suitable for connecting racks already selected. Next, screw the 3 balusters on the step , according to the building regulations, the gap was not more than 10 cm After balusters are installed, you can connect railings to them . They are best acquire a predetermined shape so that they can be bent in the direction of the ladder. After railing will be installed, you can enjoy your new spiral staircase.